Weatherization means preparing your home so that it is warmer in the winter and cooler in the summer, thereby reducing the cost of your utilities. Weatherization and the Heating Appliance Repair Replacement Program (HARRP) measures performed on your home help in keeping you healthier and your home comfortable and safe. 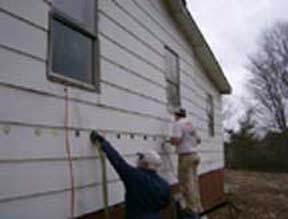 Caulking and/or weather-stripping windows and doors. Insulate attics, walls and floor areas. Repair holes in the floor. Repair or replace hot water heaters. NOTE: We are required to conduct carbon monoxide testing to help promote a safe living environment. 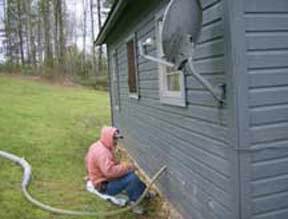 BROC provides free weatherization assistance to qualifying residents (elderly, handicapped, or low-income) in Alleghany, Ashe and Wilkes counties. The service will be provided to homeowners as well as those who rent. However, for renter’s a landlord agreement must be signed. Also, a small contribution is required from the landlord. Priority is given to the needs of the elderly and disabled. Proof of income is required. Homeowners must provide a copy of their deed or landlords must provide two signed statements agreeing that the work can be completed. HARRP (Heating Appliance Repair and Replacement Program). BROC Weatherization shall perform energy conservation measures, including evaluations, tune-ups and repairs/replacement of heating systems for income eligible clients in Alleghany, Ashe and Wilkes counties. All participants must also be served under our Weatherization progam to qualify. For more information, call Jim Absher, Weatherization Coordinator at (336) 667-7174, at our main Wilkes Office, Monday thru Friday 8:30 am - 5:00 pm.